This is the fourth PBW/Belgian Brewer collaboration. Justin Low of Dock Street was the local collaborating brewer. Justin, William Reed (of Standard Tap fame and former professional brewer) and Tom Peters tossed around ideas for this one while enjoying a few bottles Anne-Catherine Dilewyns beers. 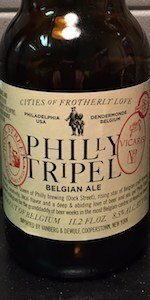 We wanted to honor what the brewer brews, yet inject a little Philly into the recipe. We decided on adding some Philly honey to a version of her Triple. fruity. soft finish. citrus rind. very good drinker. abv well hidden. 11.2 oz stubby bottle served in a Belgian snifter. Hazy apricot colored body with a moderate size white head that soon settles to a partial coat and ring. Bready with a clear note of honey, yet only lightly sweet. Very easy drinking with very well hidden ABV. On-tap 11/13/2015 at Doherty’s Ale House in Warwick, RI, served in a snifter glass. A: The beer is a light yellowish gold color, with a large foamy white head that fades slowly and leaves a thick but spotty lace on the glass. S: The aroma contains citrus, apples, other fruits, esters, Belgian yeast, some spice and some caramelized malts. T: The taste starts out with mildly tart flavors of citrus and apples along with Belgian yeast and esters. Then a little bit of sweetness comes in along with a thin malt character breadiness. There is a touch of an alcohol sting and a very mild hops presence creating a decent balance. The after-taste is slightly sweet. O: A little tasty, goes down ok, not too filling, good kick, decent representation of style, it’s a decent beer but there are others in the style that I would choose first. Poured from 330mL bottle into a tulip. Appearance: light golden hue with plenty of haze and two fingers of frothy white foam. Head has great retention and leaves a chunky lace on the glass as it slowly dissipates -- a great looking tripel. Smell: very malty and sweet with a fair dose of grainy character. Kind of like an imperial Pilsner, but with a nice tripel-y malt. Not bad. Taste: nice and sweet with plenty of malty and grainy character. Not overly complex, but there's a very classic tripel flavor here. Mouthfeel: medium body with a good carbonation and a relatively decent creaminess for a tripel. Overall: not too bad a tripel. It lacks a depth of character I like in the style, and instead relies on a classic sweetness; still, it's not a bad beer at all.